45 years later, it’s worth wondering if one needs to be aware of the historical events that birthed the existence of Z. During the time it was made, Greece was under the control of a fascist military dictatorship, factoring back to a 1967 coup. Four years before this, a popular 51-year-old left-wing politician named Grigoris Lambrakis was struck over the head with a club by a three wheeled truck speeding by, driven by hard right extremists, dying five days later in a hospital. The ensuing investigation, instead of dismissing the event as an isolated incident, led to the uncovering of connections between the assassins and the military, under the same leaders which would take control of the government a few years later and fire those on the federally-appointed team that discovered this. Z is a movie set in an unnamed country, where a popular left-wing politician (Yves Montand) is struck over the head with a club by the passengers of a three wheeled vehicle, before dying in the hospital a few days later, and it is discovered by a group headed up by the chief magistrate (Jean-Louis Trintignant) that the military, also controlling the government, were connected to this event. Sound familiar? Greek-born writer/director Costa-Gavras takes us through a 127 minute nearly non-stop thrill ride, where everything matters, and there is not a second to lose, with multitudes of characters, nearly all photographed and documented by a photojournalist (Jacques Perrin) that is seemingly everywhere. From Mikis Theodorakis’ fast and urgent score to Françoise Bonnot’s stylish-but-never-overbearing editing, it’s very clear that while Z is a movie made by people with a message to tell and sufficient anger to do it, it is not above first being an engaging and highly watchable film. It’s a good looking, well paced, and thoroughly memorable experience, from the technical elements to the creative. The writing is full of intrigue. The direction is careful but quick. The acting moves along with the plot; Jean-Louis Trintignant’s righteous stubbornness that pays off flies through the screen, and Yves Montand, playing the nameless center of the story, quickly becomes an enigma and a symbol even within the confines of the film. There’s also a current of dark comedy that flows throughout, sometimes more apparent than not – take, for example, a scene towards the end where Trintignant’s character (clearly based on Greek prosecutor and future president Christos Sartzetakis) calls several high ranking military generals into his office, one by one. As we head up the ladder of command, the number of ribbons on each man’s chest increases, and the camera focuses on them. When good old Not Sartzetakis drops the news on them we’ve waited to hear, they exit through the back door of the office, invariably then try to walk through a locked exit, and are swarmed by a progressively higher number of reporters. A seemingly mechanical series of events, shot and cut in such a way where you have a sneaking suspicion that Costa-Gavras was going for a laugh. Somehow, despite an enraging and depressing final scene, the moment before it seems all the more solidified. 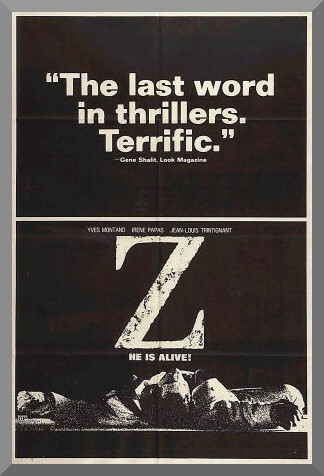 At the time of this writing, and as I have mentioned before, Z is only a few years away from hitting the half-century mark – but the thing is that this is a movie that hasn’t, nor do I suspect will for a long time, aged a day. There will always be corrupt governments. There will always be political tension. There will always be those who try to seek and expose the truth amidst a wave of uncertainty and danger. And as long as that exists, Z will hold true as an exceedingly accurate, effective, and modern piece of art, accessible both as a straight up thriller and an essay of the rightful outrage that seeped through those who made it. Despite being a French production and based upon events in Greece, Costa-Gavras properly conveys the message that this could happen anytime, anywhere.